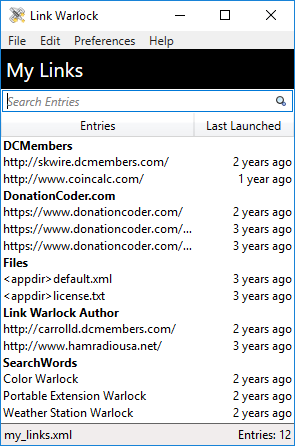 Allows you to store entries to open and launch as needed with searching and other features. Built-In toggle to show window always on top or not. 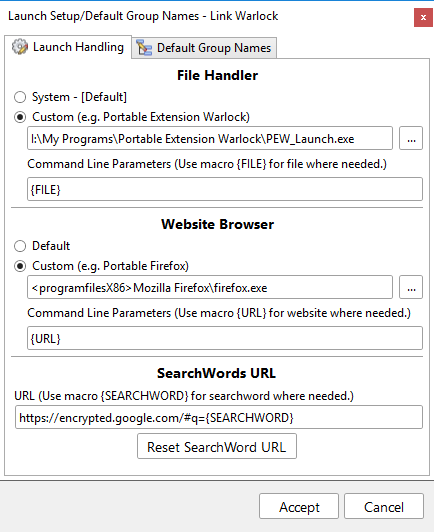 Customizable browser path, file launcher, and search url for searchwords. Customizable default group names for new/imported entries. Display/Hide parts of the interface you want/don't want to show. Display/Hide selected columns as well as even hiding the column headers all together. Each entry may have short notes added or none at all totally up to you. Enter group names as appropriate for each entry if you don't want the default group names to be used. Importation of plain text files with 1 entry per line and possible more import features will be implemented later down the road. List header goes based on filename with smart capitalization and removal of underscores for spaces. Move entries to a new group while holding the shift key and left clicking an entry and dropping over any entry in another group for automatic sort. Nice tool tips shown when hovering over the group name as well as entry information for each column. Search entries, notes, or just search both entries and notes at the same time. Text drag and drop with the option to toggle the showing of the dialog.